Adrienne: It’s up to all of us to make it work, because it is about saving peoples lives. Greg: comments: Palms has almost a year of existence, last Feb.1 the first person was moved in. Resident meetings are held all the time, people quitting &______________________. Sybil: came back to mtg, because the last one was a bad one. She complained that there was a rule against no smoking in room, yet no place to smoke outside without getting wet. No reply to complaint. Gazebo is being rebuilt. Jay: Was in Press Democrat, where is internet connection? Linda: Need to have a community & don’t need agendas. There is a Resident Advisory Committee. Let’s not yell at each other. Marshall: Yesterday's mtg.- complained about lack of internet & wifi. A resident said he would do the work. Jay: We have been told that it costs $100,000 to have internet. Library – He said we are always kicked out for special mtgs. Danielle: Resident, was told that sheriff has names of all Palms tenants. Jennilynn: Does not believe so, not that she knows of. Danielle: People are not happy. One washer and dryer that never works. Need more than one washer for over 100 people. New HUD Director - how is the predator in Chief going to effect us here???? Jimmy: Last year 8 residents died; 7 of the 8, it is questioned if they died of depression. Minimal entertainment is needed. Is there any way to pay for it on scale? Just like rent, a certain % percentage of income. He pays most rent of everybody. One death per month due to lost hope. Need entertainment. Has asked. Chris: Beating a dead horse, but need internet to be able to work. Internet is tool that must have to get out of here. Tim S.: Had to sign a consent. Hippa violation, HIPPA requires info remain private & guarantees that it will not be shared. Akosh: Desires to answer questions. It has been a year, and he has been here almost daily. Washers & Dryers: Hired company to put their own washers up, and they can service them. There is a long-term plan to convert commercial room to laundry room. Now One washer, two dryers. Adrienne: Timeline? Cable question: Can’t the Palms obtain one main connection, and every room gets feed? Akosh: He tried to get the company to donate, because of expense ($3,000/mo for cable ony. Have hospitality account- % of income. Greg: Frustrated, and wants everybody to call cable company. Jennilynn: Staff has researched, Comcast cannot do it. Now looking for Sonic to provide the service. Washer and dryer issues have now gone to the Resident Advisory Council, now being refreshed. Ben Carson had the same concerns about HUD - locally the community embraces this program, and would probably fill in if HUD cuts us off. Denise: $40/mo. for a box, but declared a residence. Will die if doesn't get entertainment. Akosh: County zoned as housing. Judy: Washroom - is it possible to make it more accessible? Jennilynn: May someday be annexed by city. She is advocating for a crosswalk. Victoria: Resident Advisory Council guidelines. Grievance process; how it works. Bob: Too much riff-raff. He has chased people out at 8pm. Everybody who works leaves. Not everybody who comes in is either a guest or resident. Stuff gets stolen. Resident accosted by visitor. Jennilyn: Community closes at 8pm. Decision made at request of community. Beth: From Georgia, not used to being homeless. Washes clothes in closet, cannot hang clothes. Objects to color on walls. It’s the same as used in mental institutions. Must use furniture. Need regular sink, unsanitary. Danielle: Rent paid for no good sink. Sybil Ellis: Everybody is bitchin' when should be thankful because before we were living in tents. Lisa; Need some level of gratification, everything takes time to do. Need security crews, carpet got stolen from 2nd floor. Need to welcome dogs, so dog owners know and can adjust. L : Safety zone out of control. Roy: Residents skills should be recognized, and that he is a taxpayer. Sandy: Agrees w/ Lisa & Sybil. Doesn’t care about Comcast. There are rental DVD's. Catholic Charities called Animal Control, and has puppies removed. Beth: Housing First, Buckelew, CWC - pay the vet, could do hands on work. I am trying to leave to go to school. Ken: Possible to have one cable line to office, & have line turned on. Then that line to Hub to feed to all rooms. Should be under $5,000. Jim: Supposed to possibly put in a hotspot for internet access. Concrete block construction makes it difficult for signal to get everywhere. Judy-Akosh: Can I just get a retractable screen door for air? Just a suggestion. Need county bus passes, living room never has any. Linda: Rotate washing days. Don’t call pound on my dog. Put community first. Jim: For a variety of different reasons, a lot of things need delineation. No personal end of life planning. Need backup plans to put agreements in place. Who is next of kin? Needs to be in writing. Most of the actions are taken for the benefit of community. A lot of residents disagree. Linda: They don't live here. Danielle: Fridge, no freezer. Told about refrigerator problems, now none! Lost weight, now 103 lbs. Been here 10 months. Has minibar, some people don’t have fridge. Ate better as homeless. Akosh: No freezer, can't eat all foods. Marshall: Should have direct authority. One person from Resident Advisory Council should go to staff meetings. Advisory council failed - checks & balances. Representative from advisory should be part of staff - to work on Airway drive, then could bring things to attention. Roy: Authority - equivocal opinion. Rep to staff. this is about poverty. Offered a good job at $20/hr. Get employment, jobs, sheltered employment. Beth: logistics - two people in one room, loves to cook, wants larger fridge to match 2 people in room, large beds for short people, short beds for large people, match rooms with people. Lisa: How rules are enforced. Friend's car broke down, so now she is banned from property forever? Dog issue, Matt slammed door in face. Her dog went to see, then told Bianca stood and lied, that she saw dog bite someone, then Cindi said none is true. Anita: Next of kin should be on application form. Internet - no computers used at home anymore. Bradley Krause: Cable & telephone. 18 key lines in every room, just needs to be switched on. Animals - extra fees. Community at-large controls. Prostitutes & drugs - told to call police. Can't leave because when she comes back, something is wrong. Actions without proper notification - Neighborhood watch. Adrienne: Grievance procedure. Tenant advisor. Victoria: Need vehicle for redress of grievances. Danielle - People complain to her about things, but people are afraid to complain. Asked Catholic Charities, No $. Vatican doesn’t have $? Marshall: Some things said are clear, and others don’t get the point; Votes for Victoria for President. Lisa: This is a successful meeting, and it should take place on a monthly basis. Adrienne: Homeless Action!! is here every third Thursday, and we should see if we can do a letter campaign to Sonic. Greg: letter campaign to editor of Press Democrat. Beth: $50/day to clean up around here, because could have paid car insurance, but instead lost her car. Get a modem through Sprint. Judy: Worked in corporate America for 33 years, and communication is important. Need follow thru. Beth: Solution - follow RAC outline from public housing authority. Jennilynn: A lot of misconceptions, and need to clear them up before one can jump to a solution. Need to explain a lot, no suggestions. Beth said she did understand. Danielle: The left-hand doesn't know what the right-hand is doing. Danielle: You've got to be kidding. Jim: Is a grievance process re: refrig. They are smaller because not enough electricity to each room. Plumbing also limited - infrastructure is not there. Jennilynn: Needs to research about some things. A lot of blood, swear and tears, so we must remember what we are here to do. Nothing is punitive. Some things are done just to be able to keep doors open due to funding priorities. Akosh donated refrigerators. Keep in mind overall project. Some things in our control, and some things are out of our control. RAC - not something had to do, but wanted to. We need more guidance or linkage. Need communal decisions that everybody can live with. We need this project to be successful. Last year, mid-winter tried to get people in fast. Let’s fix what we can, and also make sure of funding. Danielle has a point. Jackie: Thanked Jennilynn and everybody. Type up list, and bring it back next week. Each week, tackle a couple of topics. Adrienne: Thanked everybody who came. Problems like homelessness have no simple answers. For decades, we’ve seen poverty and housing costs rise. Wanting to avoid development sprawl, and enjoy a healthy environment, we contained new housing. And we knew it would result in higher costs, and the poor would suffer. Eliminating poverty is not a local option. For many years, I served on the board of directors of the local, federally-funded poverty agency with a mission to end poverty. The agency has been consumed just aiding our local poor to keep hope and children alive. Building affordable housing is closer to a local option. State and local funds, coupled with local zoning and development authority have allowed some reduced price housing to be built. Federal, state, city and private funds have opened and closed shelters when it got too cold and wet. So we shouldn’t be surprised by a movement that demands we do a better job of getting our most vulnerable residents into permanent housing without wasting money cycling them through shelters, or trying to change the behaviors mostly brought on by being homeless and poor. What should surprise us is the ease with which our representatives are moving to end homelessness without asking us to answer the question “What sacrifices are we willing to make?” . If we can’t make the poor richer, and we’re not willing to dispoil our environment so badly that housing costs drop, then it looks like our only options are to either: 1) squeeze solutions out of housing developers (and all non-poor housing seekers); or 2) squeeze currently-housed residents to provide new taxes to subsidize poor housing development; or both. I vote for both, and I think we should have a full community discussion about it. Putting aside the effort to authorize raising our taxes, here’s my workplan to begin a stronger partnership with shelters and housing developers. Here are the dates and topics of interest to those of us following the ongoing struggle to improve our City's homeless services and housing programs. All meetings are at 100 Santa Rosa Ave, unless otherwise noted. March 6th - Homeless Action Meeting, 1551 Montgomery Drive, 9:30-11am. March 7th - City Council - Another conversation by the whole Council on their directions, called for by their need to adopt a continuing declaration of an emergency ordinance. March 8th, S.R. Chamber of Commerce Meeting on Homelessness, Vintners Inn, 7-9am. Mach 11th, 10-2pm, Homeless Talk Review & Wrapup. 779 Sebastopol Ave.
March 20th - Homeless Action Meeting, 1551 Montgomery Drive, 9:30-11am. March 25th - "Homes for the Homeless", a film at Congregation Shomrei Torah, 2600 Bennett Valley Rd, 7pm. April 4th - City Council hearing report from the City Subcommittee on Homelessness and monthly declaration of emergency ordinance. April 20-21st - City Council Goal Setting. May 7th & May 23rd - City Council Declaration of Emergency Ordinance. With all this conversation taking place concerning new funding for housing navigators, focusing on homeless who traditionally haven't utilized shelters, it's important to learn about the experience of San Francisco's Navigation Center, run by Episcopal Community Services. Angela Hart, reporter for the Press Democrat, wrote an article for the San Francisco Public News in 2014. It as titled "Promise of Supportive Housing For Homeless Faces Reality of Short Supply". It should be mandatory reading for all of those trying to make sense of the Santa Rosa Homeless Summit held recently. I attended the OrgCode Summit and have known of Iain’s work for several years and I built the OrgCode tools in the local HMIS. Iain’s presentation had much value in sparking the beginning of systems change thinking. His perspective about managing vs. ending homelessness is well taken and not new. 1. Let me offer some “alt-facts” to a few Iain’s comments regarding resourcing emergency services. When somebody says something is evidence-based and doesn’t cite the source of that evidence I do my own follow up. In regard to tiny houses, homeless huts, I could find one formal research paper and the findings were generally positive. 2. Internet information was mostly based on local media articles so I contacted a peer who works at the City of Seattle. Seattle operates three dignaty village “type” projects that include huts and tents. Residents are formally case managed and data is collected. 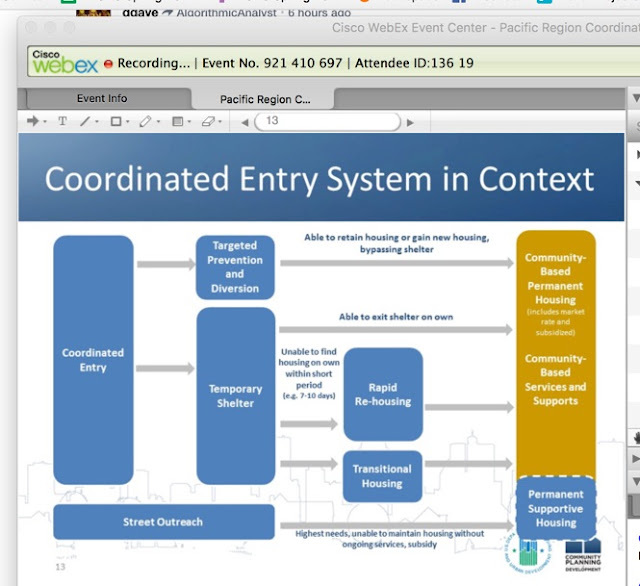 Seattle’s performance data as of two weeks ago indicates that approx 28% of the village clients had exits to some type of permanent housing. 3. Another interesting piece of research is HUD’s 37 month update of the Family Options Study. This was an eight year research initiave they characterize as “deep”, landmark”,“rigorous” and “data-driven”. It was done in 12 communitiess nationwide over three years looking only at families but the data showed no substantial difference at both a 20 month and 37 month benchmark. 4. It worked this way – looked three “types” of housing interventions - subsidized housing through vouchers, rapid re-housing and transitional housing. All three were compared to what is known as “usual care”. UC means clients who make their way through the service system without priority access to any intervention being offered. 6. What the study did find is the effectiveness of housing subsidy through PHA’s are the most sustainable programs. 7. A final hot off the press item from HUD is regarding emergency services in the Coordinated Entry design. Newly published CES flow charts do not negate Emergency Shelter or street assistance in whatever form. 8. I take this all to point to the fact that the “type” of emergency assistance (shelters, huts, encampments) is less critical than assurances to the access points to housing opportunties and mainstream benefits. This is good system design coupled with case management. 9. Please be clear I am not saying that Rapid ReHousing, Diversion or Housing Navigation should not be funded. My advocacy is to encourage caution when considering the defunding of one type of service over another and perhaps the dedication of resources to an overall system analysis that looks at these services end to end in the Sonoma County context.